Switch up your dinner menu with this vegetarian recipe from Chef Wesley Morrison, owner of the personal check services company Flavor You Can Savor. 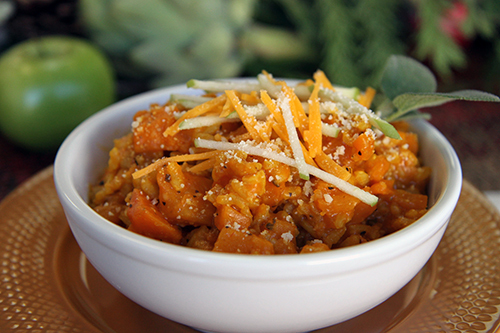 If you’re trying to eat healthier, make butternut squash risotto for dinner. The meal is packed with healthy and delicious ingredients that will satisfy your appetite. Peel the butternut squash, remove the seeds, and cut it into 3/4-inch cubes. You should have about 6 cups. Place the squash on a sheet pan and toss it with the olive oil, 1 teaspoon salt, and 1/2 teaspoon pepper. Roast for 20 to 25 minutes, tossing once, until slightly tender. Set aside. Meanwhile, heat the vegetable stock in a small covered saucepan. Leave it on low heat to simmer. In a heavy-bottomed pot, melt the butter or earth balance and sauté the sage and shallots on medium-low heat for 10 minutes, until the shallots are translucent but not browned. Add the rice and stir to coat the grains with butter. Add the wine and cook for 2 minutes. Add 2 full ladles of stock to the rice plus the turmeric, smoked paprika, 1/2 to 1 teaspoon salt, and 1/2 teaspoon pepper. Stir, and simmer until the stock is absorbed, 5 to 10 minutes. Continue to add the stock, 2 ladles at a time, stirring every few minutes. Each time, cook until the mixture seems a little dry, then add more stock. Continue until the rice is cooked through, but still al dente, about 30 minutes total. Off the heat, add the roasted squash cubes and Parmesan cheese or nutritional yeast. Mix well and serve. Top with optional garnish of cheddar and julienne apple pieces.